Mayhem broke out as more than 4,000 Kanye West fans packed Webster Hall early Monday morning for the artist’s surprise show. After the Governors Ball’s headliner was canceled on Sunday morningdue to severe weather, the “Yeezus” artist hinted at a secret show at the East Village venue immediately after his Summer Jam concert in New Jersey at about midnight. In less than five minutes after the hint was tweeted out, thousands of diehard Yeezy fans flocked to the theater that only holds 1,500 people, with lines covering up to two streets around the block. Anxious Yeezus followers were chanting “Pablo,” “Kanye” and “Back of the Line” to any fans that dared cutting in. The hype for West grew too large and too fast, forcing Webster Hall’s management to shut down the show, preventing the “Power” rapper from getting into his own venue. Kanye was “really close” to performing before the cancellation, a Webster Hall security guard told the Daily News. Concertgoers already inside the bustling venue saw employees setting up Kanye merchandise as Galantis ended its set. At about 2 a.m., “The Life of Pablo” rapper rolled up and spoke to a sea of fans through a sunroof of the vehicle he was riding in on Third Ave. Fans began climbing on top of dumpsters, scaffolding and mail trucks to get a glimpse of the self-proclaimed creative genius producer. An unlucky car parked outside the venue was covered in handprints and footprints with its roof caved in from more than a dozen anxious West lovers. The owner returned to his banged up car after the street quieted down. 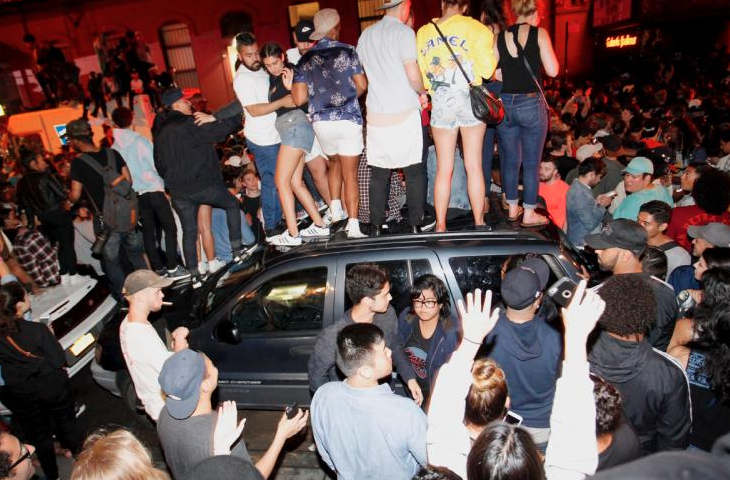 Kanye West spoke to a sea of fans outside of Webster Hall from the sunroof of a vehicle. “A mob of people were rushing the doors and jumping on cars,” Danielle Jones, a New York University student told the Daily News. Her friends described the following for West like it was a “cult. Even as the show was canceled, and West left, fans refused to budge, with officers yelling to the massive crowd, “go home, guys, party’s over” as people climbed down from the Amsterdam Billiards Club awning. As the crowds cleared, pool hall employees were forced to clean up a mess of broken glass and garbage on their sidewalk. The lucky few that managed to make it into Webster Hall amidst the chaos were turned around and told to leave the venue. Police said one person was arrested for disorderly conduct during the madness. Fans quickly left as cops circled the blocks covered by Kanye’s followers. It took two more hours after the show was canceled to clear the street. Diehard followers chased down West in his van as he drove away on Third Ave. Others lingered hoping for a second chance at seeing Kanye before rushing to Trump SoHo to check out a rumored pop-up show. Fans descended upon Donald Trump’s Manhattan hotel at Spring St. and Varick St. at around 3:30 a.m., but were disappointed to learn Kanye stopped by the hotel, left and would not be returning. Several fans trailed record producer Mike Dean spotted walking away from the hotel after three failed attempts to organize surprise concerts. He would not reveal Kanye’s location. “We made history tonight. Pablo mob,” Dean tweeted. The couple reportedly gave up on a pop-up show and went home for the night, according to the Twitter account @TeamKanyeDaily.